Several years ago (before I knew anything about tiny houses) I got first taste of the tiny life during a trip to the island of Eleuthera in the Bahamas. 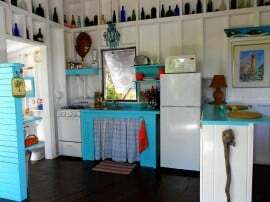 Looking for an affordable place to stay on VRBO, I stumbled upon the Starfish cottage in Gregory Town! The Starfish is owned and operated by the fantastic Kim and Terry. They make great hosts, offering up drinks in their outdoor bar and constantly improving the property for their guests. They’ve recently added a gorgeous pool! I tempted to go back to see how nice the place is now! When I first stayed there the Tamarind Tree rental cottage was relatively new and looked far different than it does now. It’s been expanded recently with an added downstairs bedroom, but during my stay the place was truly tiny — a kitchen and small table on the main floor with the lofted bed above. During our stay we had some cozy nights in the loft and had a great time hitchhiking up and down the very narrow island, soaking up sun and some local culture, meeting very friendly people everywhere we went. Here’s the Tamarind Tree again, with a newly-added larger deck. Cute eh? 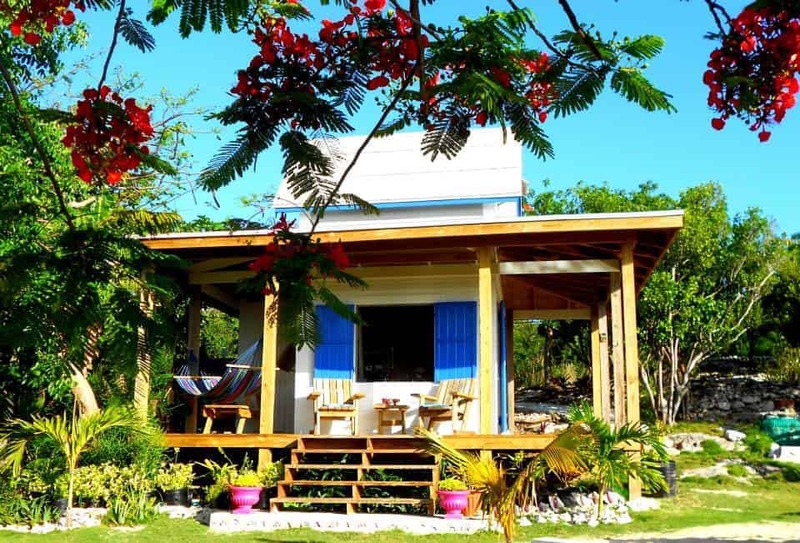 Besides the smaller Tamarind Tree, Kim and Terry have two other small cottages available to rent (collectively known as Edge of the World Properties). The Starfish is 16′ x 16′ octagon hut and the Seahorse is rustic yet beautiful rectangular cottage with an attached deck (with a view) and and outdoor shower. The property has a dock with access to the cove for swimming, kayaking or fishing and there are large private gardens for all guests to enjoy. Various fruits and vegetables are available as the seasons provide. 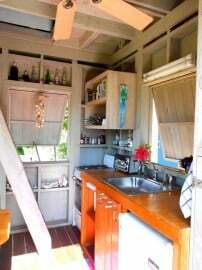 The property is within easy walking distance to groceries, shops, Surfer’s Beach, post office and other items. is located between Harbour Island and Governor’s Harbour, Eleuthera with many activities for all. Kayaking, caving, cliff diving, surfing, shelling, snorkeling, spearfishing, bonefishing, deep water access and light tackle fishing everywhere. 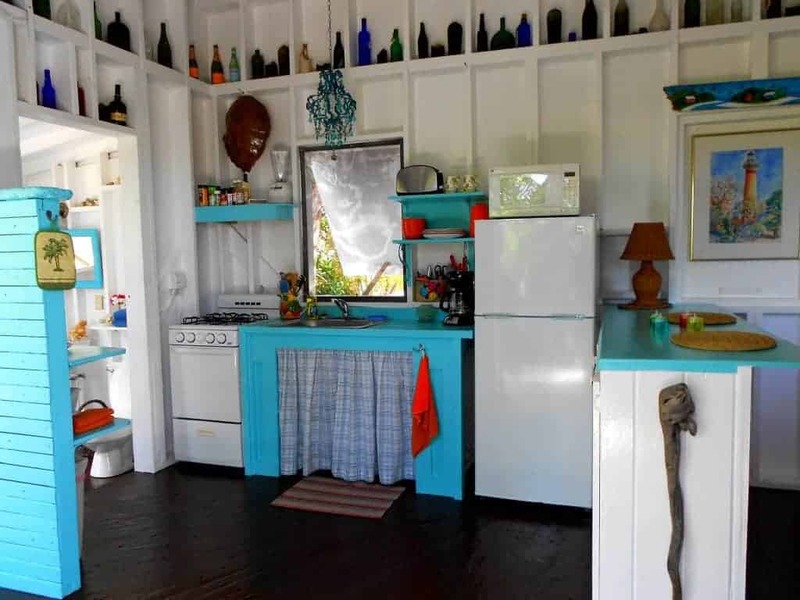 If you are every in the mood for a humble Bahamas vacation (with a taste of tiny living to boot! ), contact Kim and Terry and stay at Edge of the World Properties! They book up quickly, so plan ahead! Thank you Alex for this wonderful article about our properties….The Tamarind Tree, Starfish & Seahorse Cottages. We had no idea we had influenced your lives in such a “tiny” way. Sunshine & Love from the Bahamas! Looks like an awesome place, thanks for the article! Oh my God! This place is absolutely perfect. Can I book a reservation? How will I do that? Please advice. Hi Patricia — you can book through their VRBO page here: https://www.vrbo.com/232389 – Tell Kim I send you! Thank you Alex! Hope you are well…….. we were out working in the garden by the Tamarind Tree today. Come home for a visit some time. We would love to see you. Love & Sunshine to you! Thank you for your comment on our cottages. Edge of the World Properties, Eleuthera, Bahamas. You may write to us at [email protected] or call us at 1-242-335-5077 Home-Bahamas. We would be happy to check our calendars for available dates for your stay.